The Red Rainbowfish was scientifically described by Weber in 1908. Its scientific name is Glossolepis incisus. Around Lake Sentani in Western New Guinea, Red Rainbowfish is an appreciated food fish. The Red Rainbowfish can exceed 14 cm in length. The adult males are more colourful than the adult females and sport a vibrant shade of bright red over the body. Many males are also adorned with silvery specks. The female has a more camouflaging body colour consisting of various shades of brown and olive, with silvery reflections on the head and sides. 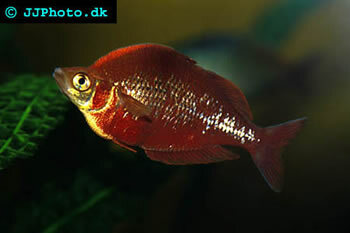 The Red Rainbowfish lives in the north-eastern part of Western New Guinea (Irian Jaya). It has only been found in the lake Sentani, which is located roughly 75 meters (246 feet) above sea level at the foot of the famous Cyclops Mountain Range. The environment surrounding the lake is hilly and Lake Sentani is connected to the sea via a shallow river. This densely vegetated lake has clear water, but seasonal algal blooms do occur. The Red Rainbowfish is listed as “Vulnerable” at the IUCN Red List of Threatened Species. Due to its beautiful colour and ease of care, the Red Rainbowfish has become a popular aquarium species, even outside Australia. This fish has been kept continuously by aquarists for at least four decades. The Red Rainbowfish should be kept in groups consisting of at least five specimens. Ideally keep your Red Rainbowfish in a 150 L (40 gallon) aquarium or bigger, because it does not fare well in smaller aquariums. It is also important to avoid over-stocking. Try to resemble the natural environment of the Red Rainbowfish when you set up the aquarium and include a lot of aquatic plants. Keep the aquarium well lit. The water should be alkaline, from pH 7.2 to 8.0. Keep the water temperature in the 24-28 degrees C (75-82 degrees F) range. Provide your Red Rainbowfish with a varied diet in the aquarium. You can for instance combine dry prepared foods with live meaty foods. Getting the Red Rainbowfish to eat in captivity is certainly not hard. 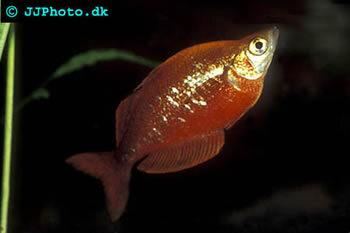 In aquariums, the Red Rainbowfish is normally bred in groups or trios (1 male + 2 females). If you want to coax your Red Rainbowfishes into spawning, keep them in a well planted aquarium and include densely grown java moss or spawning mops in the set up. Feed your fish more live food than normal. If your fish is really reluctant to spawn, try moving the aquarium to a place where it will get a few hours of natural sunlight early each morning. Even in a well planted aquarium with lots of hiding spots, the breeding period can be dangerous for the females since the male can become really aggressive. You can decrease the risk of injury by keeping the fish apart until they both seem ready to breed. You should also be prepared to evacuate the female if she seems reluctant to breed with the male. Just like many other rainbowfishes, the Red Rainbows normally release their eggs early in the morning. 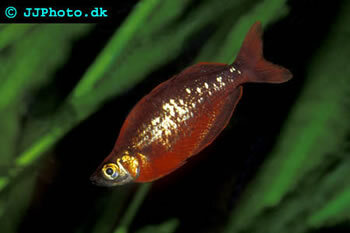 A female Red Rainbowfish can release up to 50 eggs per day, but most females releases a much lower number of eggs. If your want to increase the chances of a high survival rate, move the spawning medium with the eggs to a separate container in order to avoid predation. If you keep the water temperature in the upper part of the recommended range, the eggs will normally hatch after roughly 6 days. It is very important to keep the levels of organic waste down in the container and the water should always be hard and alkaline. Small and frequent water changes are better than a few big ones. Never allow the container to become crowded; set up new containers as the fry grows bigger. You can feed the fry infusoria and egg yolk until they are big enough to eat brine shrimp and flakes.